NOS JOHN DEERE GENUINE OEM PART # M3520T Bracket Fits Crawler Frame on 420, 430, & 40 Crawlers. We have hundreds of Used Parts, Tools, Accessories and More Available. Buck & Knobby Equipment Co. Check out my other items. 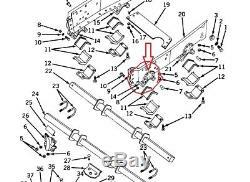 The item "JOHN DEERE M3520T BRACKET, CRAWLER FRAME 420,430, & 40 CRAWLERS" is in sale since Wednesday, September 27, 2017.